Meetings are part of the day-to-day running of businesses. Running a productive meeting requires a clear understanding of how to structure and plan for one. 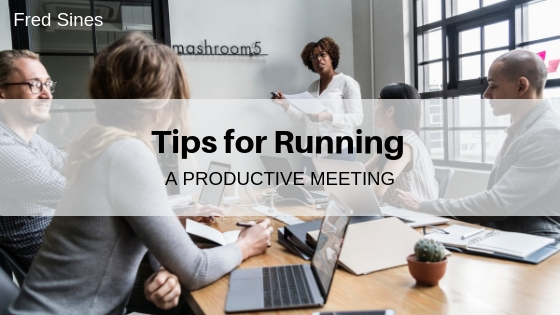 Here are some important tips on how to run a productive and successful meeting. Before holding any meeting, you should have a clear idea of what the agenda will be and the desired outcome. Before the meeting, it is advisable to inform every attendant of the agenda and objective to make them more prepared. At the start of the meeting, it is crucial to bring everyone onboard by outlining the meeting’s objective and agenda to everyone in attendance. This helps attendants to contribute toward the meeting’s objective while bringing a sense of focus during the entire meeting. The people invited to a meeting should be carefully selected to ensure that they will contribute to the achievement of the specific objectives. Inviting people who don’t need to be there is a quick way to jeopardize the success and effectiveness of the meeting. Those invited to the meeting should be directly involved and touched by the objective on the table. Experiments have proven that attendees tend to be more focused, involved, and psychologically prepared for meetings in situations where the meeting kicks off in a positive way and on a light note. This demands that you not be too official and commandeering. You may choose to start the meeting by giving everyone a minute of talk time to express themselves and share some positive ideas and experiences. Time management in meetings is highly crucial, especially when it comes to gaining the interest and support of the meeting’s attendees and participants. The meeting should have a strictly defined schedule with a start and finish time. Extending the meeting beyond the prospected finish time has a negative psychological effect upon the attendants because they generally tend to disconnect from the meeting. It is therefore crucial to spend time wisely and ensure that no time is wasted unnecessarily. Bring everyone on board and help them feel part of the meeting by assigning some light responsibilities where the need arises. Such responsibilities, once delegated, bring about a sense of involvement, creativity, and motivation among the attendees. Maurice "Fred" Sines is a businessman who is currently living and working near London, England. Fred specializes in the real estate industry where he deals in luxury mobile homes, an industry he got into following in his father's footsteps. After purchasing his first park in 1997, Fred spent a few years building up his portfolio before opening up Sines Parks. Ever since he was a young boy, Fred has worked hard to hone his business skills. He's become an expert communicator and is extremely savvy when it comes to making major business decisions and running the day-to-day affairs of his parks. People who meet Fred are surprised to learn that he has limited formal education, as he dropped out of school at a young age. Since leave school, Fred has held a wide variety of jobs including window cleaner, milk man, paper boy, and then eventually a manager in his father’s nursery. Fred started at the bottom, but he has transformed himself and his business through his consistent practice, observation, research, and incredible dedication. Now Fred Sines has created some of the leading names of luxury mobile home parks in the UK. Fred's homes are catered to those over 50, who are looking for a peaceful retirement community. Each of his many parks offers residents something different, whether they be seaside views, trails through the woods, or convenient locations near historic attractions. He works with each resident to help customize their new home exactly how they want. Fred strives to create a safe and inclusive community for those who live in his parks. When Fred Sines isn't hard at work, he enjoys playing golf both in the UK and in exotic locations such as Dubai. He also enjoys driving cars from his luxury Rolls-Royce collection or riding his motorcycle. He is also a devoted husband and father. Is FOMO Hurting Your Meeting Culture?